i’m so glad that you all want to try the recipe! please let me know what you think of it. i also got a way better shot of the colors of the tomten two posts back. scroll to the bottom of the post. one of the most exciting things that happened at SOAR was my discovery of a brand new set of dyes without heavy metals in them. although more pricey than most dyes, i am really really excited to try these. i am into facing the facts, and i must say that most art is somewhat toxic and i am the queen of being covered in whatever toxin there exists. you should see me while painting. geesh. the other reason i’m thinking of trying these is that my current house is not set up with the best ventilation etc for dyeing and so it would benefit me to use as little toxins as possible. and then there’s the if i ever get pregnant or have small children in the house while dyeing, this will be the way to go. 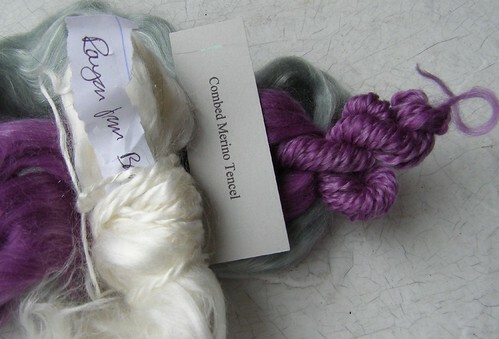 you may ask, why not use natural dyes? they also use heavy metals. oh the irony. along with that very good news, i also learned something important about the fiber i was knitting with a couple of posts back – superwash wool. i know, i know, so convenient for socks and babies and it takes dye like no other… but. the process is illegal to do in the united states. you heard me, the process is so bad (i assume for the environment and the people/animals living in it) it’s illegal. the process is at it’s bare essence this: a strand of wool is covered in scales. in the superwash process those scales are either glued down or melted off. i’m always wondering what percentage of woolie benefits they are losing when they do that. that said, i just cast on for a pair of socks for my dad with some lornas shepherd sock yarn and, you guessed it, it’s superwash. enough about superwash, which i barely use except right now, apparently. now i’d like to go on and rant talk about manufactured fibers. i took the class called ‘new age fibers for spinners’ at SOAR. 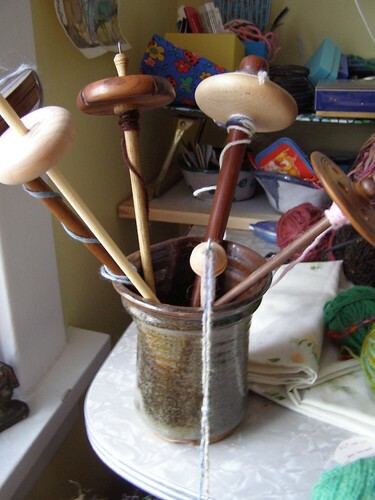 the class was very educational and we got to try all sorts of fun and interesting fiber blends on our spindles while she lectured. i’d like to focus my comments today on fibers that people think are new ‘natural’ fibers and that spinners make vegan yarns out of. included in this set is tencel (wood pulp), bamboo (wood pulp), silk latte (milk), soysilk (soy protein), and ingeo (corn). let us take soy silk as our example. 40% what’s left over from processing tofu 60% ?!?!? plastic/polymer/chemicals. deception seems to be pretty standard in this group of fibers. when you buy soy silk, there’s only mention of recycled soy protein, no mention of the chemical part. 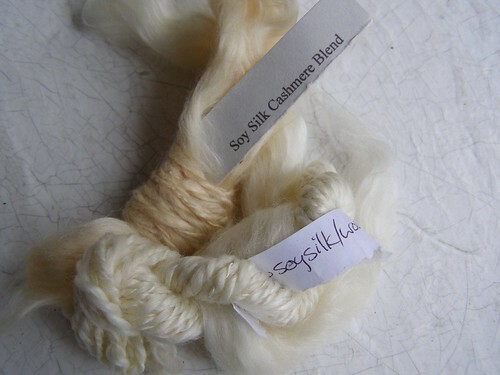 i’m guessing that the definition of soy silk is this 40/60 blend, although most people wouldn’t know that. even if the labeling is not deceptive, there may be other things sketchy. the manufacturers are allowed to call all rayons (liquified woods – so tencel, bamboo etc.) natural even though they go through a thoroughly un natural process to attain their natural results. the rule is that it starts as cellulose and ends as cellulose, so it must be cellulose. hmmm. they forget to label that most of this set also contains horrific pollution. the only one of the rayons that seems viable is lyolin – generic name – or tencel – trademark name. the processing of tencel is a closed system, so the pollution is kept to a minimum and the chemicals re-used time after time. if i were to purchase any of these fibers, i think i’d go with tencel. so what can you produce in the united states? i don’t think any of it. are these vegan yarns? vegan as in doesn’t use any animal products but destorys the environment for animals and humans alike. truth be told, i’ve always been a bit biased towards good ol’ plain wool. and now, i’m even more. This entry was posted in knitting, spinning by cosymakes. Bookmark the permalink. I think only the plant fibers (cotton, linen etc) are vegan and can be produced here in the good ol’ US of A. I’ve been told that the pesticides used in the growth of cotton these days leave mother earth somewhat less than happy. I’m with you. Give me a nice fleece of US grown wool (or alpaca, I’ll always take alpaca!) any day of the week. Also, where’s the tomten photo? I wanna see the bright! Thought you might find them interesting (if you don’t already know about them) I think I’ll still avoid it. Cotton is a tough one too and I know that doesn’t leave a non-wool wearer with a lot of options! I’m so thankful I’m not allergic to it! This was so informative. Thanks for all the information! 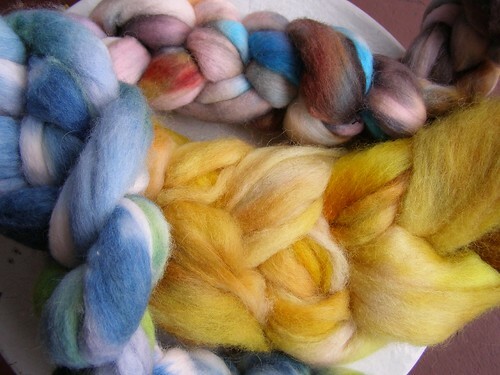 Your dyeing is gorgeous! I feel the same way about most of those fibres – they’re not really natural, they’re synthetic. I do wish I had more access to locally grown/prepared wool though. I spun some bamboo that I got in a Ravelry destash-I didn’t like it much, it felt weird, made a mess all over me when I was spinning it, but it came out very pretty and drapey. Not enough to change my mind about it, though, I doubt I’ll spin it again. I feel the same about soy, the casein fiber, tencel, rayon, etc… they’re all extruded. If I’m going to spin something extruded, I’ll take silk, thanks. It’s hard to make the right decisions about what is best for the environment in terms of being a crafter or an artist, sometimes. I love upcycling, reclaiming things, using things until they’re good and used up before throwing them away but I haven’t always been this way. Regarding superwash, it’s not the same of course because it’s more of a down wool but cheviot fiber (and some of the other down wools, IIRC) is supposed to resist felting like nobody’s business. It’s what I’m making my husband’s holiday socks from. So there are alternatives if you don’t want to go with the processed superwash. I did not know the process was so toxic-I’m not going to buy it any more if I can help it, so thanks for that.